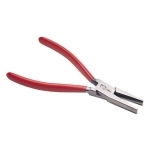 Large ring bending pliers made in German are great for extra-heavy bending jobs. Lap-joint construction with jaws that are concave/convex for shaping shanks. Edges are rounded so they will not mar metal.